1 of 5 In a small bowl, whisk oil, garlic and lemon zest and juice. Stir in parsley, rosemary, thyme, sugar, 1/2 teaspoon of the salt and all the pepper. 2 of 5 Place pork in a large resealable food-storage bag and spoon in 4 tablespoons of the herb-oil mixture. Place zucchini, squash and tomatoes in another large resealable bag; pour the rest of the herb-oil mixture into it. Seal both bags and shake to coat ingredients. Refrigerate for 1 hour, turning after 30 minutes. 3 of 5 Heat a gas grill to medium-high or prepare a charcoal grill with medium-hot coals. 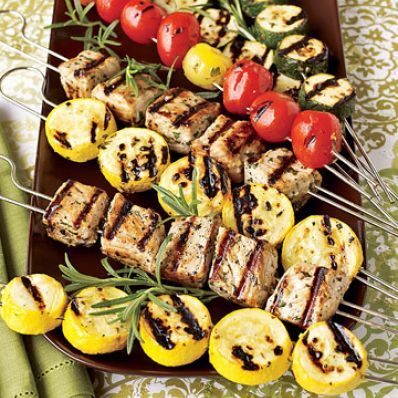 4 of 5 Thread metal skewers separately with pork, zucchini, squash and tomatoes. Grill zucchini and squash about 5 minutes per side, pork about 3 minutes per side or until internal temperature reads 155 degree F on an instant-read thermometer. Grill tomatoes about 3 minutes per side. 5 of 5 To serve, sprinkle kabobs with remaining 1/4 teaspoon salt. Per Serving: 21 g Fat, total, 9 g carb., 4 g sat. fat, 98 mg chol., 367 kcal cal., 507 mg sodium, 2 g fiber, 36 g pro.